ZERO TO STARTUP: AN INTENSIVE TECHNOLOGY START UP PROGRAM FOR YOUNG INNOVATORS. Zero to Start Up is an intensive 13-week tech startup incubator, hosted at STEAMLabs’ downtown maker space. This program empowers participants to practice working in fast-paced creative teams to develop and prototype real world products in a simulated startup process. This program aims to give youth real world experience that can take them into their university careers, as well as the future job market. Youth discover their personal strengths, develop entrepreneurial skills and work with real world tools and technologies. 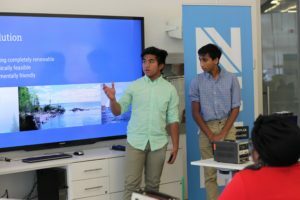 The goal is to build up the next generation of technologists and encourage self-confidence through collaboration in science, technology, engineering, mathematics and computer science (STEM) fields. In teams, participants will ideate, design and prototype a product that attempts to solve real problems using the latest technologies. Teams will then present their product in the style of a pitch to potential investors. Participants will be exposed to business tools and processes used prolifically in startup communities – design thinking, persona marketing and business model canvasing – to build a physical technology product with a real user in mind. The products that the team create will be prototyped at using 3D printing, laser cutting, electronics, and where applicable, Internet of Things technology. There are no prerequisites for level of technology or business know-how and teams are allocated based on personal strength surveys in order to distribute skills and personality types. Inspired by the theme “Future Cities”, the bright minds of Fall 2016 cohort designed three impressive projects: Trash Hoops, Compost to Watts and Aquify. 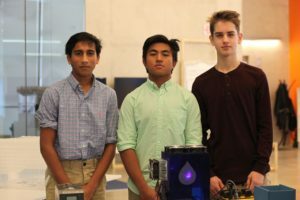 They were given the challenge of solving real world problems faced by the City of Toronto – and they did. Trash Hoops designed a creative way to encourage better waste management and Compost to Watts designed a method for getting electricity from compost. From left to right, teams Compost to Watts, Trash Hoops & Aquify at the Zero to Startup Fall 2016 showcase at Ryerson University. 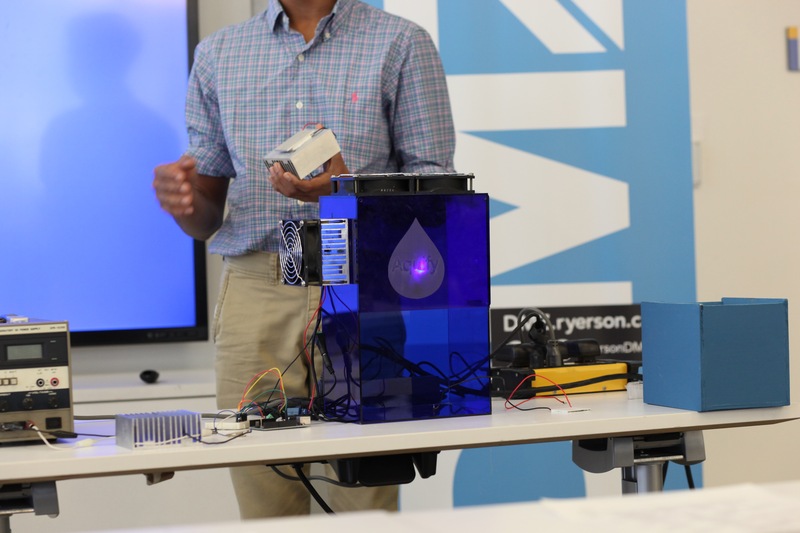 Team Aquify set out to reduce the need to transport water over large distances and make clean, drinking water more accessible to everyone with a device that converts humidity in the air into water in a matter of seconds. Since the very first round of Zero to Startup, the response has been amazing. Two teams were invited to present their projects on the Discovery channel for Invention Week. 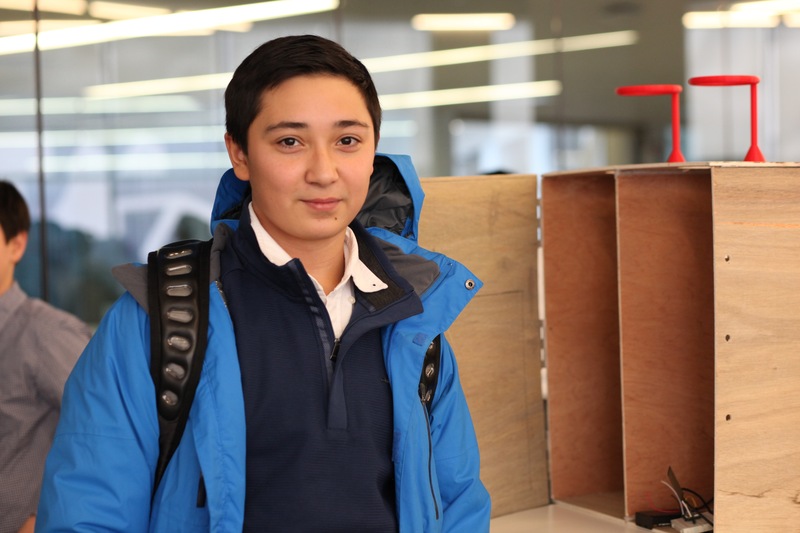 One teen was even employed because of their Zero to Startup project! 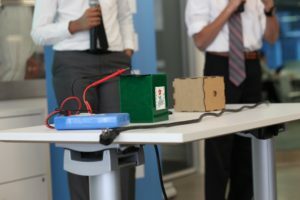 In the spring of 2015, a City Engineer sat on the panel of judges and was so impressed with the Smart Street Light project with a mesh network of air quality sensors that they invited the group to come present in front of City council. 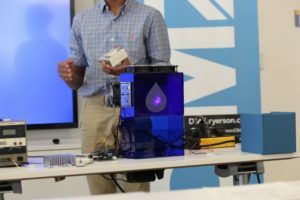 Team Aquify presenting their projects at the final showcase in front of a panel of judges at Ryerson University. Zero to Startup participants are immersed into the world of technology from week one. An engineer from the City of Toronto introduces the theme and explains the challenges facing cities relating to climate change, energy consumption, pollution, traffic, health, etc. By week 2, participants are given various robotic challenges in a hands-on, interactive Arduino & Particle lesson. They are introduced to HTML/CSS and the concepts of personal branding by building websites from scratch in Thimble by Mozilla. In the first three weeks, they learn design thinking (how to understand a problem, observe and create a point of view). 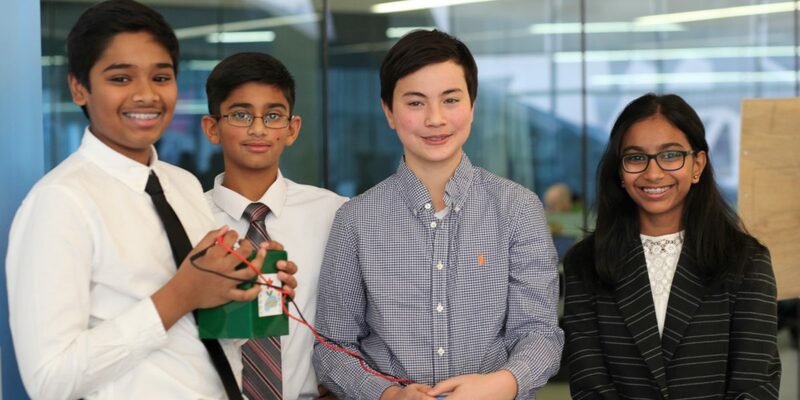 By week 4, they have their first test run: design and build a working prototype, create a website and create a sales pitch to present by the end of class. The entire class becomes a single company that aims to solve a real-world problem with four main teams: Hardware, Industrial Design, Web Design/ Data Visualization, Business Model. By the end of the class, the business model team presents their pitch as if it were they were pitching to the City Council. Week 5 & 6 are all about planning individual future cities projects. They pitch their ideas to the rest of the class who provide constructive feedback and help them narrow down their best project ideas. In their final groups, they research all electronic parts required for building the final prototype, and create an organized team they will turn into a business, complete with a website and sales pitch. Week 7 to Week 12 are all about building. With the help of an experienced mentor, they test and iterate product development, complete their working prototype that they will actually build on site at STEAMLabs, using laser cutter, CNC router and 3D printers. 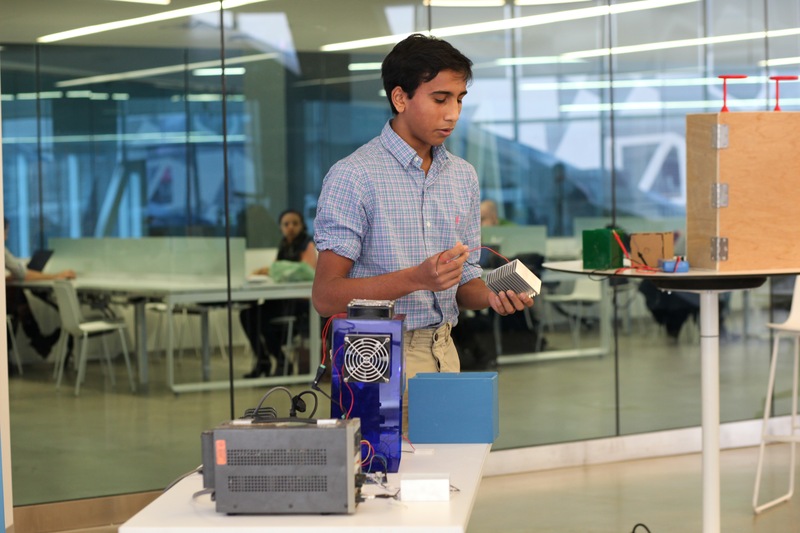 On the last week, all teams have the chance to show off all of their hard work and present their pitches to a panel of external judges of industry professionals, as well as their friends, family, and of course, their Maker Education teachers. 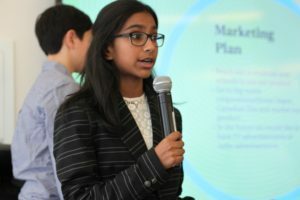 “The participants had truly evolved into young adults as they presented their products in front of the panel of judges. 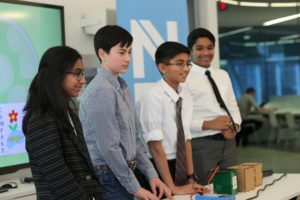 Kids already grow up with technology all around them, so it’s more important now than ever to teach them how to create, modify and program technology for their futures.” says Meera Balendran, a STEAMLabs Maker Educator. 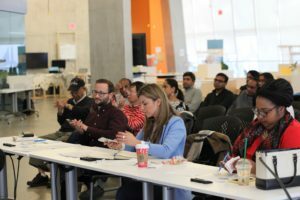 The Fall 2016 Zero to Startup cohort presenting their projects at the final showcase in front of a panel of judges at Ryerson University. The program is designed to be flexible, teaching technical skills based on the individual needs of the groups. Each group is in charge of documenting their progress in a blog, so they can show not just their final product but their entire process, for high school, university or job applications. The teens learn invaluable 21rst century job skills, like critical thinking, problem solving & collaboration, which are often overlooked in most high school education or vocational training programs, but so essential to a successful career. “They learn that creation is more fulfilling when on a team”, says Kat Barrett, a STEAMLabs Maker Educator, “and the support received from one another is something that can’t be learned from a text book”. STEM and Maker Education are all essential for today’s youth to stay competitive in tomorrow’s economy, and Zero to Start Up is an invaluable program that empowers youth, and allows them to step into the makers, entrepreneurs and innovators of the future they were meant to be. Learn more about Zero to Start Up, register or to apply for a scholarship by filling out this application form.